As the field of human-animal interaction (HAI) continues to gain traction, studies that straddle occupational therapy and HAI can help validate occupational therapists’ involvement in HAI-related work, such as animal-assisted therapy. However, more importantly, they can elucidate how animals can help us help our clients participate in activities that bring meaning to their lives. Think outside the box to acquire funding and partnerships for such research; the directors of several HAI programs we contacted—including the Consortium for Animal Assisted Therapy at the University of North Texas (discussed in part II of this series) and the Human-Animal Interaction Studies project at Colorado State University —told us that though they weren’t currently doing research with OTs, they’d be open to exploring the possibilities. 1) The National Institutes of Health’s National Institute of Child Health and Human Development (NIH NICHD) has funding earmarked for HAI research, particularly as related to child development, health, and therapeutic interventions. 2) Waltham, the pet science foundation associated with Mars Petcare (a pet food and care company), not only has a research partnership with NIH, but also sponsors its own HAI research with an emphasis on companion animals’ effects on children. 3) Though based in the veterinary school, Tufts Institute for Human-Animal Interaction (TIHAI) includes an OT on its board of advisors and has an OT ambassador. TIHAI collaborates across disciplines to research the impact of HAI across the lifespan. It also sponsors a Pet Partners visiting animal program in the central MA area, which could yield additional opportunities for research as well as practice. 4) The Virginia Commonwealth University Center for Human-Animal Interaction (CHAI), part of the school of medicine, supports OT by serving on student research committees, and is open to working with OTs on interdisciplinary research. Additionally, CHAI sponsors Dogs on Call, a program that provides animal visits to hospital patients, often as part of OT or PT in the acute-care setting. 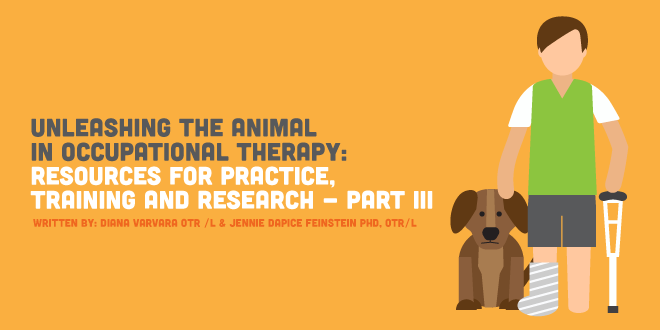 5) Though it focuses largely on animal-assisted activities rather than animal-assisted therapy the nonprofit Pet Partners (also discussed in part I) provides visiting animal-handler teams to work with OTs at their places of employment, and welcomes research related to this and its other endeavors. 6) More localized private companies also offer partnership possibilities: Green Chimneys, a Putnam County, NY, nonprofit that serves youth in nature-based programs, and CHUM Therapeutic Riding, an OT-owned facility in Mason, MI, that provides equine-assisted interventions, are just two that have an interest in funded OT-related research. Others are out there, we know; so if you’re interested in HAI/OT research, be sure to scout your local area for potential partners. Want more info on animals in OT? See part II, which explores educational opportunities.